Stellar winds from the O 6.5 III giant BD+60 2522 have blown a large bubble around the star, which is part of the Sh 2-162 HII region. This sector is the dustiest in the Cassiopeia arc (the brightest region of the Perseus arm as seen from Earth), and contains a 2 million solar mass complex of molecular clouds within the Perseus arm. It also includes two of the most energetic OB associations in the Perseus arm, the brightest radio source in the galaxy as seen from Earth (except for the Sun), and the easternmost major star formation region in the local Cepheus clouds. Blaha and Humphreys list 5 O-stars in the Cas OB2 association , and more recent research has added at least two more. Widely varying different estimates are available for many objects in this region. 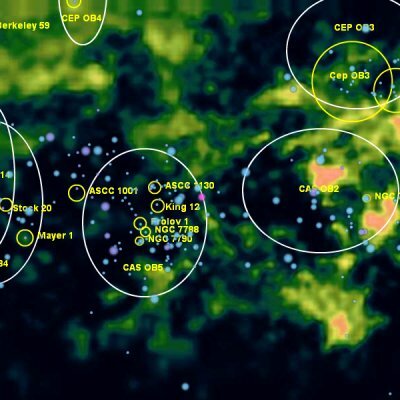 One of the major puzzles for astronomers studying the Perseus arm is whether Cas OB2 is really one major star association or if, alternatively, the various star, cloud and nebula complexes observed in this direction are spread out at many different distances across several thousand parsecs. There are at least seven HII regions or groups of HII regions in this direction, each associated with one dominant ionising star. Sh 2-157 (Sim 13) is a ring nebula around the Wolf-Rayet multiple star system WR 157, in the 7.5 million year old Basel 3 (Markarian 50) cluster. WR 157 is a close double with the other component being a B1 II giant  and a period of about 2 days. Sharpless associates Sh 2-157 with a number of other stars, including the B0 Ia supergiant HD 219287, which Blaha/Humphreys identifies as the most luminous member of Cas OB2 by bolometric magnitude. One study says that this cluster is part of Cas OB2. However, Van der Hucht gives the distance to WR 157 as 3390 parsecs  and a recent study estimates the distance to this system as 4200 parsecs . Both estimates would appear to place it well beyond Cas OB2 and the Cassiopeia arc into the region between the Perseus and Outer arms. The dusty Cas OB2 and the clear Cas OB5 are two contrasting associations in this microwave image that also includes all the ionising stars, clusters and associations known in this sector. Two star formation regions in the direction of Cas OB2 are associated with two major molecular cloud complexes in this direction (G and C), which in turn are both part of the larger and more diffuse Cloud B. Both are energised by obscured O6-7 class stars embedded in dust clouds and fully visible only in infrared. 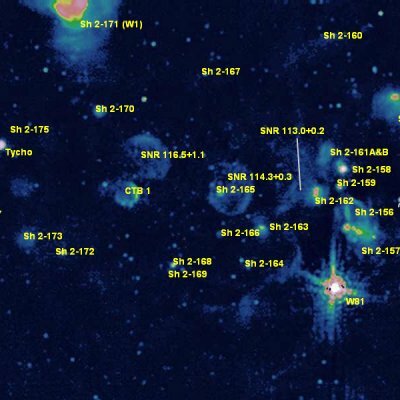 There are at least 11 high luminosity infrared sources in the direction of the 595 thousand solar mass molecular cloud [UUT2000] Cloud G associated with Sh 2-158 (NGC 7538). The brightest of these, NGC 7538 IRS 6, contains a class O6-7 star that is likely the main ionising source for the entire HII region. If Sh 2-190, the nebula within the Cas OB6 association, looks like a human heart, then Sh 2-158 looks like a human brain. This prominent nebula needs a popular name, and as it currently does not have one, the Brain nebula seems appropriate. Also called IC 1470, the Sh 2-156 HII region is part of the star cluster NGC 7510. It appears to be ionised primarily by an O7 class star deeply embedded in a dust cloud. This bright core is only one of five distinct and apparently independent emission sources within the 392 thousand solar mass giant molecular cloud [UUT2000] Cloud C.  The distance is estimated to be about 3500 to 4000 parsecs. , ,  However, Kharchenko estimates the distance to NGC 7510 as 2075 parsecs , which would put the cluster (and possibly the nebula as well) in front of Cas OB2. In addition to these four major regions, the Cas OB2 region also contains four less prominent HII regions: Sh 2-163, Sh 2-164, Sh 2-165 and Sh 2-166. Sh 2-166 is ionised by the O9 V star BD+60 2607 with a distance as 2800 parsecs. This star is missing from the BH catalog completely and SIMBAD gives no spectral class or luminosity for this star. Russeil says that Sh 2-163, Sh 2-164 and Sh 2-166 are all part of the same star formation complex. It is not clear what she means by this, however, as she also gives widely different distance estimates for these nebulae that scatter them across about 1500 parsecs. The B0 II giant BD+63 1964 is the second most luminous member of Cas OB2 according to BH. It is located much further north than the traditional boundary of Cas OB2 and has been identified as a high velocity runaway star in the Perseus arm. It seems possible that this star may have been ejected from Cas OB2 by a supernova explosion or stellar collision. 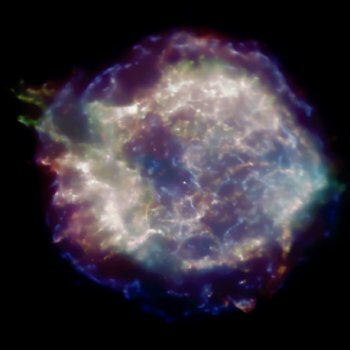 The Cassiopeia A supernova exploded within a dense dust cloud and its remnant is best seen at radio or X-ray frequencies. Cassiopeia A (W81, SNR G111.7-02) is the second youngest known supernova remnant in the Milky Way and the brightest radio object in the Galaxy as seen from Earth (except for the Sun). It was the last of the three supernovae known to have exploded during the European renaissance. Unlike Tycho's and Kepler's supernovas, Cassiopeia A exploded inside a dense dust cloud south of the Cas OB2 association and was not observed until the advent of radio astronomy in the mid-20th century. The Chandra X-ray Observatory's first observation of Cassiopeia A discovered its central object, apparently a neutron star . Cas OB5 is very different from its neighboring association Cas OB2. While many of Cas OB2's ionising star clusters and O-stars are visually obscured and embedded in massive and dusty molecular clouds, the region around Cas OB5 is much clearer. Cas OB5 is surrounded by a huge 750 thousand solar mass expanding shell of both atomic hydrogen (630 thousand solar masses) and molecular gas (120 thousand solar masses) at a distance of about 2500 parsecs. Supernovae and solar winds from the central clusters of Cas OB5 seem to have driven most of the gas out into the expanding shell. Consistent with this shell structure, Cas OB5's ionising clusters are largely found towards the centre of the association, and the rather faint nebulae associated with this association are on the outskirts, within the expanding shell. The cluster NGC 7790 is best known for harbouring 3 Cepheid variables: the F8 Ibv supergiant CF Cas and the binary Cepheid system containing the F9 Ib class CE Cas A and the F8 Ib CE Cas B. These pulsating F-class hypergiants, like similar such Cepheids in the Milky Way and other galaxies, can be used to measure distance because their period is related to their true luminosity. Given their rarity, the presence of a Cepheid binary in HC 7790 is especially interesting. Kharchenko gives a distance of 2944 parsecs and an age of 81.2 million years for NGC 7790, and lists two ionising stars: HIP 118163 (B2III-IV), and TYC 4281-1230-1 (B 1 V). A more detailed photometric study determined a distance of 3300 ± 230 parsecs and an age of 120 ± 20 million years , which is essentially the same given the error bounds. There is also a Wolf-Rayet star in this direction, WR 158. Van der Hucht assigns it a distance of 7940 parsecs , placing it in the Outer arm. There are two supernova remnants visible in the direction of Cas OB5. A recent review concludes that both of these remnants lie within the same atomic hydrogen bubble at a distance of 1600 parsecs. Confusingly, this review describes this distance as "local", although 1600 parsecs appears to be well beyond the Cepheus clouds which mark the outer boundary of the Orion spur in this sector and places these supernova remants in the region in between the Orion spur and the Perseus arm. Many of the nebulae and supernova remnants in this sector are seen most clearly at radio frequencies. Avedisova says that BD +60 39 (O9 V) is the ionising star of Sh 2-173 and the distance is 2900 parsecs. She suggests a connection to the star cluster NGC 103. Sh 2-173 is bright in hydrogen-alpha but less visible at infrared and radio frequencies. The nebulae Sh 2-167, Sh 2-168 and Sh 2-169 all appear in the same direction as the hydrogen shell surrounding Cas OB5. 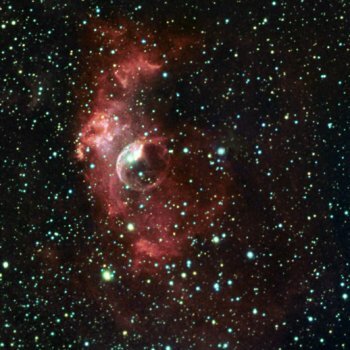 Very little has been published in the scientific literature about any of these nebulae. Sh 2-168 is by far the brightest of the three in infrared and radio and Sh 2-169 appears close to it in the sky. Avedisova gives the ionising star of Sh 2-168 as the O9 V LS I +60 50 at a distance of 3100 parsecs. Blaha and Humphreys say this star is a member of Cas OB5. Blaha/Humphreys and SIMBAD both give the class for this star as B0 V. Sh 2-168 contains the loose infrared star cluster [BDS2003] 47 at a distance of 3800 parsecs. The bright infrared region IRAS 23504+6012 appears in the same direction. An analysis of the CO associated with Sh 2-169 finds an 8800 solar mass molecular cloud. CO velocity in this direction gives a distance estimate of 1500 parsecs , and a more recent estimate is 2300 ± 200 parsecs . Sh 2-172 and Sh 2-173 fall in this sector of the sky but they appear to be part of a complex connected to the Cas OB4 association to the east, and are discussed in the section on the Tycho (130°-120°) sector. The HII region Sh 2-170 is located north of Cas OB5. The sole exciting star is DM +63 2093, an O8 V star of 31 solar masses, which has created a cavity in the surrounding hydrogen-alpha emission and is located at a distance of 2300 parsecs according to one study. Avedisova gives the class as O9 V and estimates the distance to this star as 2800 ± 700 parsecs. Blaha/Humphreys gives the class as O 9.5 V, estimates the distance as 2290 parsecs and says that this star is not a member of any OB association. SIMBAD lists DM +63 2093 as a G5 class star, but this seems incorrect. Russeil associates Sh 2-170 with the star cluster Stock 18 and gives a distance of 2600 ± 270 parsecs . All three distance estimates are roughly consistent given the error bounds. The HII region Sh 2-160 is located to the northwest of Cep OB3 at 900 parsecs. Sharpless lists three possible ionising stars including the B0 III giant HD 218323, which Blaha/Humphreys assigns to Cep OB3. 2. ^ Humphreys, R. M. 1978, Astrophysical Journal Supplement Series, Studies of luminous stars in nearby galaxies. I. Supergiants and O stars in the Milky Way. and the unpublished catalogs available here. 23. ^ Abt, H. A., Levy, S. G., & Gandet, T. L. 1972, Astronomical Journal, Radial velocities of 65 early-type stars. 31. ^ Alcalá, J. M. & Arellano Ferro, A. 1987, Revista Mexicana de Astronomia y Astrofisica, vol. 14, The distance and reddening of the open cluster NGC 7790 and the luminosity of its three Cepheids. 36. ^ Nazé, Y., Vreux, J.-M., & Rauw, G. 2001, Astronomy and Astrophysics, What is the real nature of HD 108? 45. ^ Green, D. A. 2004, Bulletin of the Astronomical Society of India, Galactic supernova remnants: an updated catalogue and some statistics. and here for the most current version of this supernova remnant catalog. 48. ^ Testi, L., Olmi, L., Hunt, L., Tofani, G., Felli, M., & Goldsmith, P. 1995, Astronomy and Astrophysics, Sequential star formation in the Cepheus molecular cloud: the S 155/Cepheus B interface.